The agreement covers flight opportunities through 2015 on SpaceX's Falcon 1e rocket, an evolved version of the company's lightweight booster that became the first privately-developed launch vehicle to reach orbit in 2008. Astrium will help SpaceX market the rocket to European governments and space agencies for dedicated launches of very small satellites. "With dedicated launch services, customers with very small payloads can launch independently to low Earth orbit, giving them greater control over the launch and actual launch schedule," an Astrium statement said. "With the Falcon 1e, Astrium and SpaceX will be able to offer these services at the lowest cost per flight." SpaceX's website lists a Falcon 1e launch price of $10.9 million, a figure it says is only applicable through the end of September. The 81-foot-tall Falcon 1e rocket will be powered by an improved Merlin first stage engine and feature an enlarged payload shroud. It will also debut larger first stage propellant tanks and upgraded avionics. SpaceX says the Falcon 1e can deliver approximately 1,300 pounds to a circular polar orbit 435 miles high. "I am proud that a prominent leader in space transportation, satellite systems and services would choose to team with SpaceX," said Elon Musk, SpaceX CEO and chief technical officer. "Our agreement with Astrium opens exciting new doors for SpaceX. Together we will meet the growing demand for reliable, low-cost and dedicated launch services for very small Earth observation and scientific payloads for European institutional customers." 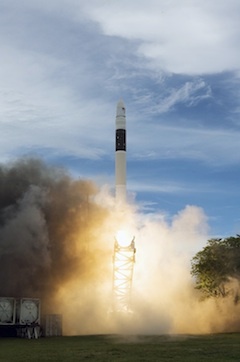 Musk said in a July interview that the Falcon 1e's first launch is scheduled for mid-2011 from the company's facility on Omelek Island at Kwajalein Atoll about 2,500 miles south of Hawaii. The Falcon 9 rocket and Dragon spacecraft are SpaceX's top priority, putting the Falcon 1e on the backburner for now. "Any company has to pick its focus," Musk said in July. "I've told the guys we need to stay really focused on keeping the Falcon 9 track record good and making Dragon successful. Falcon 1 is a priority after those. We certainly expect to fly the Falcon 1e next year, but probably not the first quarter though." Astrium last year contracted with SpaceX for the launch of an unspecified Earth observation satellite on a Falcon 1e rocket. The Falcon 1e will also orbit 18 second-generation ORBCOMM message relay satellites on multiple flights. Taiwan's National Space Organization also plans to launch its Formosat 5 remote sensing satellite on a Falcon 1e rocket as soon as the end of 2013. Astrium is a major shareholder in Arianespace, the European commercial launch firm responsible for marketing the Ariane 5, Soyuz and Vega rockets internationally. Jean-Yves Le Gall, Arianespace's chairman and CEO, said Thursday the SpaceX agreement is for standalone launches of payloads smaller than capacity of the Vega rocket. "It's like comparing apples and oranges," Le Gall said. Instead of clustering small satellites on a single Vega rocket or a Russian vehicle, customers could opt to place their payload on a dedicated Falcon 1e rocket. In an interview with Spaceflight Now, Le Gall said the Vega rocket should make its first flight in mid-2011. The solid-fueled Vega launcher can carry more than 3,300 pounds to a standard polar orbit with an altitude of 435 miles, according to the European Space Agency.